Stop Smiling: You stopped drawing politicians a while back. Have you ever been tempted to start again? 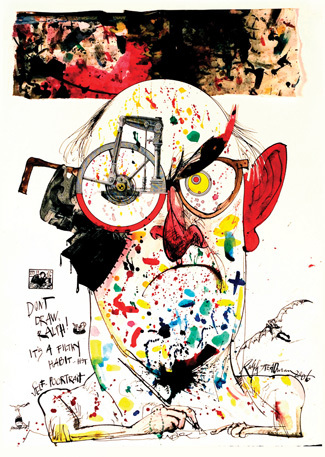 Ralph Steadman: I stopped in 1987 because it felt indecent to draw someone you wouldn’t ask home for supper. But that was just personal. I thought there was something unwholesome about political caricature based on the certain knowledge that each time you draw one of the bastards it feeds into their monstrous egos, because they always want to own the drawing. No matter how bad the likeness, how hideous the caricature, to them it’s a powerful rendition, fodder for their insatiable egos. The more wicked and cruel the portrait, the more passionately they want to own it, as though they have somehow earned the glory of this vicious, awful vituperation. It is only a one-man campaign to wither the inflated sense of self-importance of our venal representatives. I doubt there’s a politician alive who has felt the draught of my indifference. And no, I’ve never been tempted. I wouldn’t give any of them the satisfaction. SS: Tucked away in all your splendor in this desirable corner of England’s green and pleasant land, do you hear any echoes of the big bad world outside? RS: Evil happens when good men do nothing. Who said that? Here in England we don’t really care about local government. The infrastructure has always been there, everything ticks over, the binmen come on Mondays and Thursdays, the school’s round the corner, there’s a public library in the High Street and Dad’s roses are coming on a treat. The butcher, baker and candlestick-maker put themselves up for election and nobody bothers to wonder what they stand for or goes out to vote or not vote for them. We think, well, somebody’s got to do it. By dint of popular indifference the candlestick-maker puts himself up and is democratically elected, knowing he can get away with murder. He will have power, people will doff their caps, he can tell lies, line his pockets, chop a tree down. He’s a local councilor. He’s in planning. And it’s all built on the inertia of the populace. There’s something happening in Maidstone now. It’s a small town. They just started adopting the French habit of having tables and chairs on the pavements outside cafes when it’s sunny and warm. It looks pretty, does no harm and people enjoy it. So what do they do? They decide to charge a levy for having chairs on the pavement. That incensed me. Then there’s the riverside. It’s enough to make a rat weep. They took our riverside and turned it into a dual carriageway. Then they built a huge new courtroom, which physically is a bigger shock than a 20-year jail sentence, right where there used to be a lovely marketplace for people to set out their stalls. Here’s another one. I go for a walk on Saturday mornings. I cool out, drive into town to go to the art shop for inks and things. I park my car in the car park. They sell only three-hour tickets, so I always have more than two hours left on my ticket when I’ve done my errands. I’d wait for someone to drive in so I could hand it over. I’d say, here you go, there’s still two hours on mine. And they’d say thanks very much. It was a nice thing to do. Made me feel good and community spirited. But they twigged it. Now you have to write your car number on your ticket to keep you from handing it over to someone else. They’ve managed to curtail a human being’s inclination to be neighborly. At a stroke. It’s not as if they were losing money. They’ve got their three hours’ worth. Except they want more. They want double and triple their money for nothing. It gets to me. I obsess about it. What do they look like, these people? I have to imagine them, nasty bastards, members of Masonic lodges and golf clubs, with minions scurrying about slapping fines on cars. That’s small-town blinkeredness. It allows the venal to progress in an underhanded way. It enables them to become liars, manipulators, have people do their greedy bidding, pass contracts over to their pals. And the public elects them, perceives their power and says, “Yes, you’re the bully and now we side with you because we know which side of our bread is buttered.” So there’s your microcosm for you. SS: What about the macrocosm? RS: The prognosis is that we are wiping ourselves out as we speak. I find myself in a kind of outrage meltdown, depressed, socio-phobic, in a spiritual retreat I wish I could get out of. People sense what is happening and perish their own thoughts. We live in dread and all we can think to do is pre-empt the catastrophe by blowing the world up. That’s power for you. They’re saying now that there’s something about the Islamic faith that says before the messiah returns there must be total annihilation. The Bush administration thought that one up. Because they’re religious, too, they know the tricks of the trade. They’ll hammer Iran and use that as an excuse. Like children. Wham, now see what you made me do. You started it. A whole-world Hiroshima. Easy come, easy go. The planet will reassert itself in a few billion trillion years and what’s a few billion trillion years between drinks?